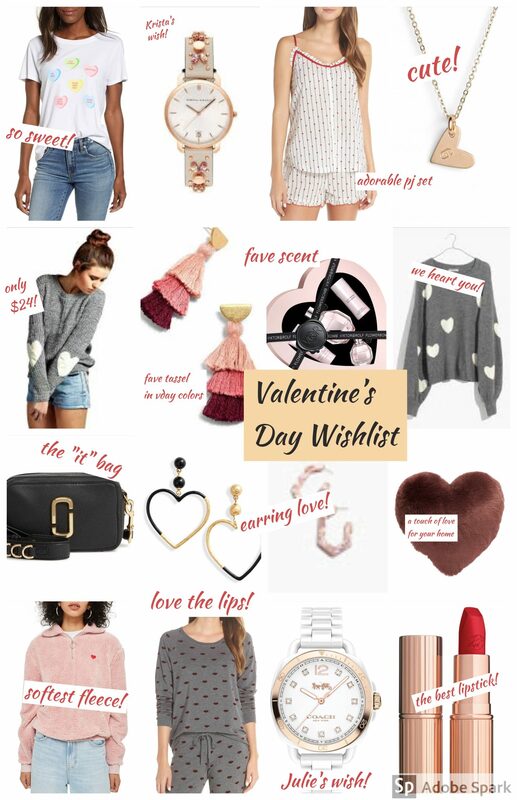 Make it easy on your sweetheart this Valentine’s Day and send him a link directly to this roundup of Valentine’s Day gift ideas. Or heck, just shop for yourself and tell him “let’s just exchange cards this year.” Shopping links below! Candy heart tee: Such a cute graphic tee to wear under a fun jacket on Valentine’s Day! Jeweled watch: Krista strongly hinted to her husband that this is what she’s “wishing” for on Valentine’s Day. It’s such a pretty, feminine watch! PJ shorts set: This adorable set is from one of our favorite pajama brands! We love that the straps are adjustable. So cute and comfortable! Initial heart necklace: Everyone loves a personalized gift–this cutie of a necklace would make a perfect gift for a daughter or friend! Heart sleeve sweater: We prefer holiday-themed clothing that’s more subtle. This sweater is perfect with the heart elbow patches! Tassel earrings: Highlight all the pretty pinks of Valentine’s Day and have them to wear throughout the spring too! Perfume set: This is one of the best-selling scents on the market! You can’t go wrong. And such a beautiful presentation in this heart-shaped box! Heart sweater: We found another subtle sweater we love! You can continue to wear it after Valentine’s Day because it’s gray instead of pink or red. Heart earrings: You’ll have so much fun wearing these on Valentine’s day and all year round! The gold & black are so versatile. Pink tortoise shell earrings: Krista has these earrings and highly recommends them to all of you! The pink color is so soft and pretty and they make a fabulous statement without being too huge. Faux fur heart pillow: What a fun accent pillow to add to your bed or couch for Valentine’s Day! Lips PJ set: Loving all these lips! A fun alternative to hearts on Valentine’s Day! Another fun gift that would be worn all year round. White watch: Everyone needs a bright, white watch for spring! This is the watch Julie is “wishing” for from her husband! Our husbands better come through lol! Our new fave lipstick: This shade is such a pretty blue-red color that won’t come off even with many Valentine kisses! We love this brand! Hydroflask: Something they will use forever in a nice manly color. 8 oz. travel mug: Julie’s husband (who drinks way too much coffee!) loves this size for coffee portion control while out on the job. Silicone ring: Romantic and practical. Looks like a wedding ring but is safe and comfortable. Perfect for the husband who has a hands-on job or leads a very active lifestyle. Fitness Dice: A fun way to workout at home. We kinda want this for ourselves! We know both our husbands would love this unique take on creating an awesome workout. Crewneck sweater: These are the best sweaters! High quality and a very flattering fit. Whether you stay in or go out, we wish you a very special Valentine’s Day with people you love!